Technical analysis is based on one main principle – trend. The markets move in trends. Speculators and investors are hoping to buy a security at the beginning of the upward trend of low cost, benefit from it, and sell when it finish on a high price. Although this strategy seems very simple, the implementation is very complicated. Technical analysis is used to determine the trend when it changes and when change when to open a position when to close the position. When the analysis is wrong and the position should be closed. That explains everything. In professional investment platform MT4 charts and indicators are most reliable and useful. Software is best choice for technical analysis. 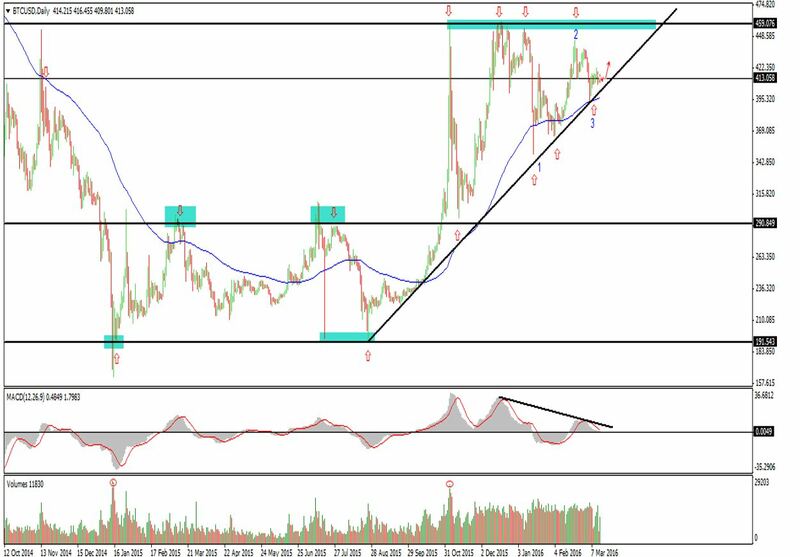 We will make a brief technical analysis of cryptocurrency against the US dollar. For this purpose we will use indicators: SMA (Simple Moving Average), MACD, and Volume. 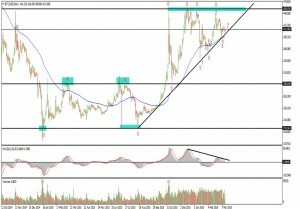 Let us briefly explain the role of these indicators in our analysis. SMA – moving average is one of the oldest tools used by technical analysts. Daily changes in the prices of shares, stocks and exchange rates can vary a lot. By moving average we decrease those daily variations. Technical analysts use them to iron the data, thereby facilitating the identification of the main trend. The main reason to use moving averages is to smooth out a short-term trend noise and to focus on the real trend, which is suitable for the time range of the investor. At its core, the moving average is only one value that a network of certain historical figures. For example, 20-day moving average is a value that each price over the past 20 days telling us how the value of the group for 20 days rather than its single value. MACD– was developed by Gerald Appel in 1982. The indicator contains a histogram and signal line. The histogram shows the distance between a slow and a fast moving average. The signal line is the moving average of the histogram. Pure graphics has always been the most useful of Price Action traders, but every trader has to know how to apply this and other strategies also to be fluent in usage of different indicators. The role of Volume– measure of volume, for example traders’ expectations after the break point can be measured as trading volume (Volume). If prices have reached the level of support / resistance during significantly increasing of the volume and the period of “Traders remorse” is shot. This means that new expectations are accepted by most traders as the remorse’s are minority. And vice versa: a breakthrough in moderate volume and “remorse” in increasing volume mean that changes in the expectations of traders are insignificant and return to baseline expectations (i.e. output prices) is unavoidable. As mentioned above, areas of support and resistance, we explained the nature and role when prices are rising and then turn down the highest point on the rise, the peak is called “resistance level”. It is the level at which sellers can be so strong and aggressive as buyers and stop rising. If the sellers (offers) become stronger and more aggressive than buyers (demand), the result is a subsequent drop in price from the top. The level of resistance in most cases is an area, not a certain price level. The support is opposite to the resistance in that it constitutes a bottom or a series of bottoms. In support level buyers are just as strong and aggressive as sellers and stop the fall in prices. The perception for the support and resistance suggests that in the future prices will also stop those registered areas, i.e. they are marked psychological barrier of prices. The zones will persist during the time and will become barriers of the future price actions. They will not only continue their existence after a time period, but once they are well known they will change their functions: the support from the past will become resistance and the resistance from the past will become support. Let’s go back and main part, namely the situation in Bitcoin / US dollar. Since the beginning of 2015. Experienced a lull and consolidation and price moves ​​between $ 200-300 for Bitcoin without following increasing or decreasing trend. The price breaks 100 day moving average and bottom-up and top-down and did not last long, therefore follow the areas of support and resistance. This is repeated until the end of 2015. Then the price does break 100 period moving average, is increasing the volume of shoppers, then break of the resistance reached new high and strong refundable down. End of recovery is a test reached resistance which now becomes support and remains above the moving average, forming a bullish trend, which is confirmed by the drawn trend line. Any correction, which is testing the trend line can be used as a possibility of buying and profit. As seen clearly the price tested the resistance and sooner or later respected as a springboard trend line, which during the time becomes more “upper” appearance as the price continues, Test (bounce) to grow. From some time a narrowing of the price can be seen lower highs and higher lows and form a sort of triangle. In technical analysis this reaction price leads to a breakthrough from above or below, followed by a strong move at least to the nearest support or resistance. Since the trend is bullish, we would say that “the trend is our friend” and would continue their purchases. But this is the market and it’s likely to happen also indicator MACD, when making lower lows and the price makes higher highs, we have a simple bear market, which leads us to believe that it was possible scenario for breakthrough, test of the trend line and drop the price. But the script is not flawless and any moves to make the price of a fundamental perspective and looking at the history and evolution of Bitcoin would say that the price would reach to higher values. How to Profit from Important New Zealand Economic Data Releases? How to Trade the Gap? Forex scalping…is it worth it?